Various cost saving opportunities can be realized by redistributing and replacing high-consumption activities. These opportunities range from rescheduling activities for off-peak hours to replacing machinery with more efficient models. A close relationship exists between facility operations and power usage. Changes in equipment utilization policies and procedures have significant effects on electricity costs. Track Power Usage Over Time - With data every 5 seconds and an intuitive, graphical historical data viewer, Watts Aware provides trends by the hour, day, month, and beyond. Engage in Continuous Energy Saving Efforts - Energy monitoring is most effective with ongoing involvement by all stakeholders. Watts Aware's included dashboard console provides immediately accessible, understandable data. 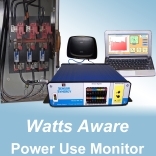 Several Watts Aware units can be monitored from a single dashboard for a comprehensive overview. One Watts Aware unit can monitor over 10 MW of power. Network-accessible data allows a variety of users to access power use data. Remotely compare power usage of several facilities side-by-side. Compare energy efficiency between shifts. Consider power use when scheduling electricity-intensive operations. Ideal for evaluating the cost of lighting. Flexible installation allows Watts Aware products to be moved to consider a variety of energy initiatives. 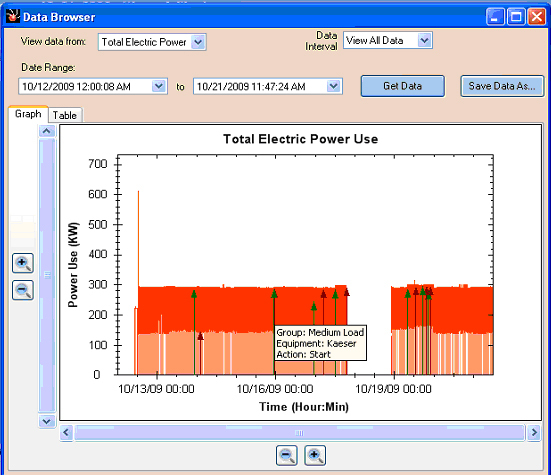 Power use data can be easily annotated to identify and track individual equipment.